After months of work, here at 24 North we’re thrilled to celebrate the opening of our on-site Sunset Green Event Lawn. 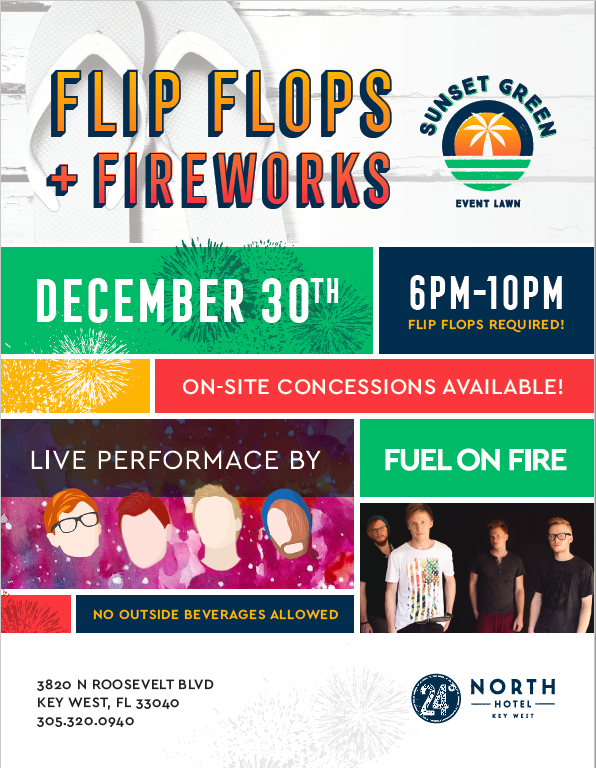 Put on your flip flops and join is Dec. 30 for live music, on-site concessions, and of course, fireworks. Pre-game New Year’s Eve with live music by Fuel on Fire, a formerly-local band reminiscent of Coldplay. The band of five brothers (now Nashville-based) is the first of many bands we plan to welcome to the Sunset Green. Check out some of their tracks on Spotify here. The best weather in Key West is usually in winter months, so we expect a stellar evening of music, drinks and fireworks. And remember to pack your flip flops! They’re required. The opening celebration marks the beginning of our Sunset Green Event Lawn, which is an open-air space located between 24 North and our sister hotel The Gates Key West. It’s a spacious event lawn with versatile amenities, set to host almost any event you see fit. We have a beautiful pergola for a ceremony or renewal of vows and our team can add anything from tents, dance floors and even portable air-conditioning units for whatever type of party you want to throw. Stay tuned in on our Facebook page and in the meantime, start planning your trip to Key West. Planning to book a stay in Key West? Check out our specials here.